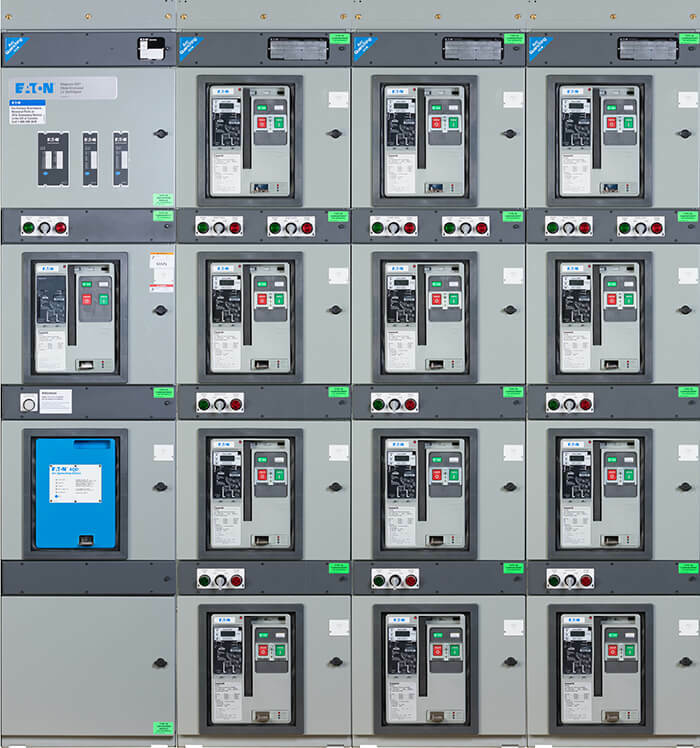 As safety has become a top priority in the industry, and acceptance of arc-resistant technology has increased, arc-resistant testing has expanded to include medium-voltage metal clad switchgear, low- and medium-voltage motor control, and recently medium-voltage adjustable frequency drives. Properly latched or secured doors, covers and so on do not open. That arcing does not cause holes in the freely accessible front, sides and rear of the enclosure (Type 2). No indicators ignite as a result of escaping gases (cotton indicators are placed 4 inches from the sides of the equipment being tested to simulate cotton clothing worn by an operator). All the grounding connections remain effective. Since the introduction of arc-resistant electrical equipment, the design paradigm has been to create a method of containing the energy from an arc flash event and redirecting it away from the operator. These methods typically include heavily reinforcing the electrical equipment enclosure using thicker-gauge steel, reinforced hinges and multipoint door latches to contain the arc energy and prevent enclosure fragmentation and burn-through. Mounted on top of the gear, plenums connected to ducts serve to redirect the arc gasses through the top of the equipment and out of the room. Such designs benefit from simplicity and acquisition costs. These passive arc-resistant designs require no electronics or electrical power to function. Minimal technological advancements were required to develop these designs. All that was needed was a more robust equipment enclosure. The incremental costs of such arc-resistant equipment remain relatively low, requiring only the addition of more steel and more durable hardware to the existing design. However, there is a distinct set of drawbacks to passive arc-resistant construction. First and foremost, arc-resistant designs do nothing to prevent the propagation of arc faults and, therefore, do not protect the internal components of the equipment. Small arc flash events may damage individual components inside the equipment, while catastrophic arc flash events can destroy the equipment entirely, requiring a complete replacement. In addition to the cost of repairing and replacing damaged or destroyed equipment, there can be substantial revenue lost due to the downtime of critical processes that relied on the damaged equipment. Arc-resistant equipment also increases installation and construction costs when compared to standard equipment. Arc-resistant equipment often requires that electrical rooms be constructed with higher ceilings to provide clearance above the gear either for direct venting into the space or for the plenums. Installing the ducts through walls to redirect the arc gasses out of the space adds more cost, as does fencing off or otherwise restricting access to the area where the ducts vent the arc gasses into the environment. And, there are some industries that cannot tolerate venting arc gasses into the environment. Hazardous areas such as those classified as Class I, Division 2 by the National Electric Code (NEC) Article 500 may contain flammable gases, so venting into these environments is not permissible. The efficacy of arc-resistant designs hinge on operation and maintenance personnel following relevant administrative controls at all times. The safety afforded by arc-resistant construction depends on the equipment’s ability to contain and redirect the energy during an arc flash event. Arc-resistant equipment, by itself, does not reduce incident energy under any circumstances. If doors are left open or improperly latched and if bolts are removed or panels are missing, the equipment may not adequately contain and redirect the energy. Therefore, it is incumbent upon the operations and maintenance personnel to ensure that the equipment enclosure remains completely intact at all times while the equipment is energized. And if maintenance activities require opening doors or removing circuit breakers while the equipment is energized, personnel must be educated to understand that the arc-resistant rating will be temporarily compromised.